Ready Player One started life as a book by Ernest Cline, a tribute to the pop culture he had experienced over his formative years and beyond, therefore the natural choice to direct the movie version was Steven Spielberg, for he was an instigator of vast swathes of entertainment of that time, and as he was still around and working, he took a break from the worthier efforts he had been indulging in to make a project of "pure imagination". The sort of thing he had been making in his nineteen-eighties heyday in fact, but for a story that packed in so many references to other films, television and games, there were two touchstones many who enjoyed the blockbuster were likely to settle on as major influences. They were 1971's Willy Wonka and the Chocolate Factory, and 1982's Tron, neither of which had been huge hits in themselves on their initial release, but thanks to showings on television and the release on home video had become staples of many an eighties childhood. 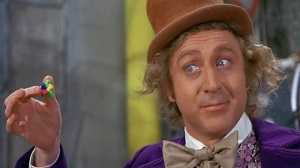 Wonka was the creation of Roald Dahl, possibly his greatest children's book and certainly the one most identified with him, though while he had been hired to write the screenplay he was somewhat casual in his attitude to deadlines, and producer David L. Wolper stepped in to fill in gaps and generally move the project onwards. While Dahl had wanted comedian Spike Milligan to play the lead, Gene Wilder was cast instead - but it was a mark of his talent you can't imagine anyone better. This idea of a remote father figure who must be negotiated with for a happy life was repeated in Ready Player One, but in the Chocolate Factory Wonka has become a recluse who for reasons best known to himself has sent out five Golden Tickets in chocolate bars for kids to visit his establishment, and four of them are, to put it bluntly, utter brats, while the audience's avatar was Charlie Bucket (Peter Ostrum, who never made another film and became a vet). 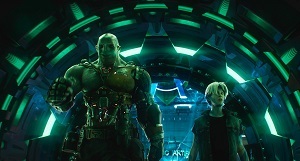 Charlie was the decent child whose impoverished background means he truly earns his prize, which in the world of Ready Player One translated to succeeding at the games everyone plays as a way of blocking out the miseries of real life, a pointed metaphor that may have appealed to Dahl. As the characters are guided by Wonka through various levels, the children lose one by one at the tests, or games, they represent, though one of those kids was perhaps more forward thinking than Wonka would have preferred to believe. Mike Teevee has his personal flaw as an obsession with watching television, which ultimately doesn't give him square eyes but does see him turned into a broadcast, not coincidentally shrinking him in the process. On the subject of metaphors, wasn't Mike a potent one for the generations who grew up with the galloping progress of technology, using it to promote themselves in the media and online in a way that he would have been delighted with? Wonka's desire to keep himself to himself may not have been so outrageous after all. Almost a decade later, Tron was unleashed onto an unsuspecting world to... general indifference. It seems ridiculous now, but the arrival of computer graphics in a big movie was reacted to with some resistance, though the way that director and co-writer Steven Lisberger lost his grip on the story when he seemed to be so entranced by his visuals instead did it no favours with a potential audience seeking a simple adventure. All that jargon the characters came out with may have sounded futuristic, but it also befuddled the typical viewer, leaving those who did pay to watch it utterly confounded as to what the point of it all was, yet here we were, over three decades later and a genuine blockbuster had used it as its template. Not the box office template, of course, as Spielberg enjoyed another huge hit, and one that was not a sequel or remake which was refreshing in the twenty-first century movie climate - or was it? Certainly many films of the new millennium were taking inspiration magpie-like from the wealth of material that had gone before, and Ready Player One was the most blatant example of that, yet there was a difference between this and Tron. 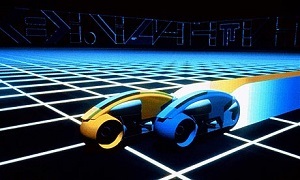 The earlier Disney movie had sought to capitalise on its futuristic appearance, and indeed what fans it did pick up were either those who were well-versed in computer sciences or fascinated by what animation was doing at the forefront of a revolution in technology, of which Tron was the most up to the minute instance. Yet Ready Player One was doing the opposite: looking back onto pop culture of the past to explain where we had reached, and would reach as the concept of classics and cult and trash all melded into one conglomeration of entertainment. When Jeff Bridges is drawn into the landscape of the computer and its games that exist on a different plane of reality, it was the cue for a series of action sequences with still-sleek graphics and striking production design that pointed to the immersive quality of those experiences in leisure everyone who knew what they were talking about were predicting. What they didn't predict was the shortening of attention spans thanks to that very tech, meaning the interest of the viewer or player had to be fed well-nigh constantly. 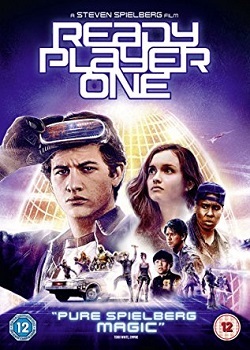 When it came to the movie of Ready Player One that drive for a barrage of references the book delivered did not extend to as much Spielberg as you might have expected, for the director generously wanted to leave out as many of his own works as he could; or perhaps he was abashed at having to repeat himself. Whichever, there was an abundance of other efforts made apparent in practically every scene of the story's internet substitute, evolving the way it saw the addiction to memes and avatars and watching selected clips or hearing songs would, so the net turned into a system of shared memories and in-jokes for the initiated as much as it was a device to communicate and learn about the world. You might observe Cline (who adapted the script with Zak Penn) and Spielberg were having their cake and eating it too, given the final message was that it was fine to turn off the online world and go out into the real one every so often, so get off those phones and appreciate what is around you. This was starting to sound like a Luddite theme in 2018 when the movie arrived, since failing a global apocalypse that brought all the networks down there was no way in Hell most people watching this film were going to forget about their social media presence, which had become a game in itself with rewards for completing tasks and behavioural achievements, those virtual high fives that protagonist Wade, or Parzival as he's known online (played by Tye Sheridan) manages to avoid. Though not through want of trying, as the online OASIS, the cyberspace almost everyone on the planet loses themselves in, proves more attractive than coping with the reality of solving problems in a physical realm, something this future acknowledges people have simply given up on. Although this was intended as a fun thrill ride of a motion picture, there was that nagging worry about spending so much time online you would neglect not only human interactions face to face, but also your sense of perspective and even decency would be gradually erased by too much exposure to a world that insisted you turn into a caricature of yourself when you exaggerated the personality traits you wanted to be strong, no matter how damaging they were. Ben Mendelsohn was once again typecast as the villain, though more urbane than usual, and his avatar, as the CEO trying to win the OASIS game set up by the now-deceased genius Mark Rylance, was significant as a he-man business executive (though not He-Man and the Masters of the Universe He-man), and he also had the equivalent of an online troll (T.J. Miller) as a sidekick. Rylance's character was a soul directed by his fears, so that he had never had a relationship with a woman because he was terrified to kiss a girl for instance, therefore a digital landscape represented a far easier method of living out your hopes and dreams than actually achieving them with a living, breathing person who happened to be in the same room. Spielberg, predictably, was accused by the naysayers of taking steps back from his then-recent prestige pictures, so there was not a single reference to a Best Picture Oscar-winner to be seen here, be that his own or anyone else's: it was the ephemera that lasted, suggesting anything with any hint of seriousness outside of a fantasy narrative was going to be rejected by the masses. Fair enough, it was somewhat patronising to expect that audiences simply went to see one type of entertainment and had no interest in the sincere and improving material with a message to impart about big questions when they were addicted to watching CGI explosions as time went on. On the surface, a curiously anti-Hollywood decision from Hollywood's most famous director, except that he recognised, as with his greatest popular efforts, you could smuggle serious points in there too, which was why they resonated, be that Wonka's lesson of unselfishness or Tron's faith in a higher purpose.